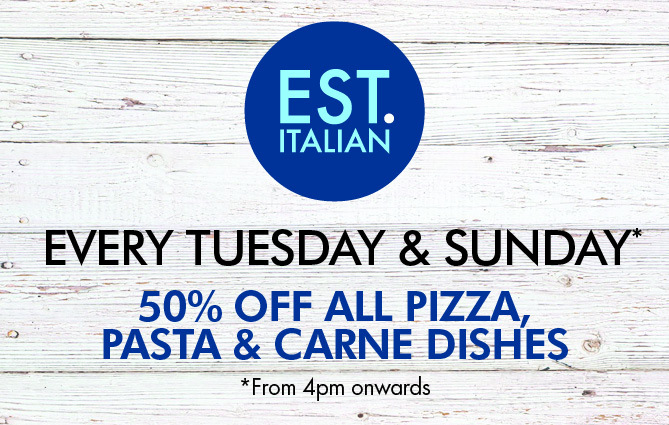 Est.Italian | An Italian restaurant and bar in West Kirby, Wirral. 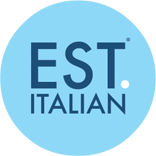 Welcome to Est.Italian – an Italian restaurant and bar in West Kirby, Wirral. The Tuesday and Sunday 50% Offer is subject to terms and conditions and does not apply on Mothers Day. Our relaxed, friendly approach coupled with the contemporary, stylish interior provides the perfect setting for a great dining experience. We are obsessed with creating beautiful, authentic Italian dishes using daily deliveries of the finest, freshest ingredients and specially imported authentic Italian produce. Handcrafted pizzas, perfect pasta dishes, 28 day aged beef and fresh fish daily specials create a medley of flavours that prove irresistible to our diners. Expertly crafted dolci desserts including choux pastry specials and our famous home made Tiramisu provide the flawless finish to your dining experience at Est.Italian. We make everything fresh to order so we are always happy to accommodate specific dietary requirements and even make gluten free pizza and pasta dishes on request. (Please call ahead to ensure that we are equipped to provide this). Reservations are highly recommended. To reserve your table at our West Kirby Italian restaurant, team on 0151 625 2489. Fill in your details below to receive news and special offers via email..